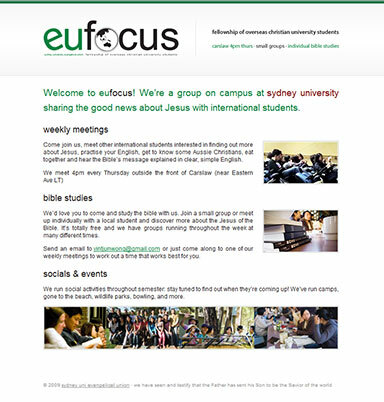 Spent a little while this afternoon cooking up a small website for SUEU‘s international student group, Focus. Born largely out of the realisation that http://www.sueu.org.au/activities/international_students/ is probably just a little too long to be catchy, it’s just a microsite designed to be relatively static (as the current page is) and redirect people to real-world activities. Hopefully the new euFocus web address will serve well and be a tad more bite-sized/amenable to inclusion on posters, print media, etc. For usability, I’ve gone the non-geek route: http://www.eufocus.org/ (nofollow’d here) can pick up anyone who needs a normal-looking web addres via 302 redirect. Lovely. Future ambitions may include online event rego and internationalisation fun times, as about 90% of Focus-ers are from mainland China. This will ideally take the form of user agent locale identification — it’s not mission critical and geolocation stuff is largely irrelevant for what is a very geographically constrained activity.